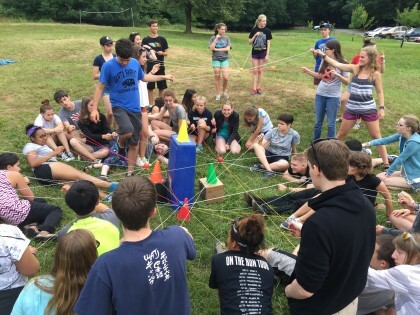 Back to "Teen Leadership Programs"
Camp Fire Central Puget Sound and Camp Sealth can provide you with customizable leadership curriculum perfect for clubs, teams, classrooms or retreats. 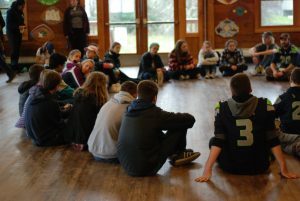 Add one of our workshops onto your Camp Sealth retreat or conference, or bring one of our trained facilitators to your school. Camp Fire and Camp Sealth can facilitate workshops year-round at your location, or plan a trip to Camp Sealth on Vashon Island, WA between September and June. Pricing is dependent on the length of your workshop and number of participants and groups can be of any size. We recommend our curriculum to middle and high school aged students and will tailor each lesson to the specific age of your students and the goals you’d like to accomplish. Outdoor Education curriculum is available at Camp Sealth to provide your students with an opportunity to connect to the outdoors! communication style before diving into hands-on challenges to practice your skills in managing conflict. Discover the barriers to communicating with your peers, teachers, parents, or teammates and ways to stay productive, positive, and efficient. Explore the various leadership roles of working on a team. Are you a natural team leader, or do you tend to take a back seat? Learn how can you lead others and be a contributing team player from any role and how you can overcome obstacles as a group. Team building workshops are great for existing groups, newly forming groups, or individuals coming together to learn personal leadership skills. 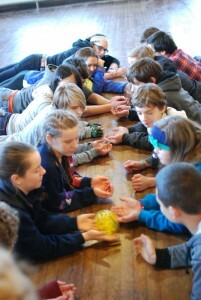 Schedule a team building session at your school before or after your camp sealth retreat to build on the experience! Learn new ways to get personal goals with achievable steps, and learn ways to cope when things don’t go according to plan. How will your mindset change when you are faced with uncertainty or failure? Build a new sense of perseverance and “grit” for sticking with your goals! Discover the roots of your personal value system and how you perceive the world. What is important to you? How do you participate on or lead a team with others who don’t share your beliefs or values? Learn skills for resolving disagreement respectfully, shift your perspective, and see the world through the eyes of someone else. Form a group of middle or high school aged teens and participate in teen-driven service projects throughout the year. Camp Fire can provide a facilitator to help organize service offerings, lead curriculum, and supervise projects, and can also provide curriculum for you to lead a Teens in Action group on your own! Contact us to start a Teens in Action group! Attend a day-long workshop summit, usually held in the fall, or sign up for one of our weekend retreats to camp sealth on Vashon Island! Volunteer for a summer program or join us for one of our special event projects to earn community service hours. Camp Fire and Camp Sealth rely on teen leaders in our summer camps to help bring energy and enthusiasm to our campers! The girls and boys of camp fire – 5,000 of them in king, kitsap and north mason counties – learn to be active, healthy and engaged members of their community. They explore new ways to protect and appreciate the environment. They develop empathy and compassion as they learn to help others and to celebrate and honor diversity. Learn more about Camp Fire Central Puget Sound! Questions about Teen Leadership opportunities? Contact Rebecca Bobko, Teen Program Manager, at rebeccab@campfireseattle.org or (206) 826-8934.